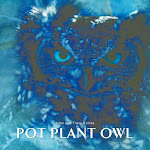 Pot Plant Owl: 8 Dec and we have chicks! We've got two little chicks sitting in the new pot plant nest with a very proud mom. We've been out the past few evenings and every time we've returned home, we've found PPO sitting in the nest. Last night we came home and noticed that she was sitting more upright and stared at me when I tried to say hello.Pappa hooted on the rooftops for a long time last night and didn't fly too far away. Woo-hoo! I am so excited that there are two! What a wonderful Christmas surprise! Now for the naming and are we having a cam or no? Such a beautiful sight! Thank you! Yay PPO & Papa, and Congrats to you Tracy and Allan! <3 So happy! That is such good news for us Owlaholics. Hope that the cam get online so we can watch the new bobbleheads. Such thrilling news. Great! It seems "NATURE" knows what he has to do! :))) Good luck PPO and Papa for bringing up two chicks! This is so exciting. Congrats!! Please oh please oh please can the cam be turned back on soon? This is wonderful! Can't say how happy I am! Thanks for sharing, thanks for ALL! What wonderful news to read this morning! So happpy for PPO and Papa! So happy for you and Alan too! Thank you Mother Nature! I was happy to learn PPO had two healthy chicks. Way to go PPO and Pappa. Tracy and Allan: thank you for sharing the news with us. Wauwie, i'm so happy that those eggs were viable. I hope that the chicks are growing healthy and strong. Congratulations! Congrats to PPO and Pappa, and also to Tracy, Allen, and Destin.. So Happy for all of you. Thanks Tracy for sharing this owlsome news with all of us... Will look foward to your updates. Hugs to you all... Grammie57. What awesome news. . .Congratulations, PPO and Pappa, Allen and Tracy. . you all must be walking on "Cloud 9"!!! Smiling here--this is terrific! Wishing all the best for the new family! Wonderful! Thank you Tracy and Allan for being such flexible hosts! Oh, this is such exciting news. I couldn't believe your note on FB that PPO and Pappa have a new little family. They are so cute in the pic you posted .. thanks. :0) I'm crossing my fingers and toes hoping we will have a cam to watch. Please let us know if there may be a possibility. Hi Tracy & Allen, Thank you for the wonderful news! So happy for all of you and for PPO and her family! Love and hope to all!